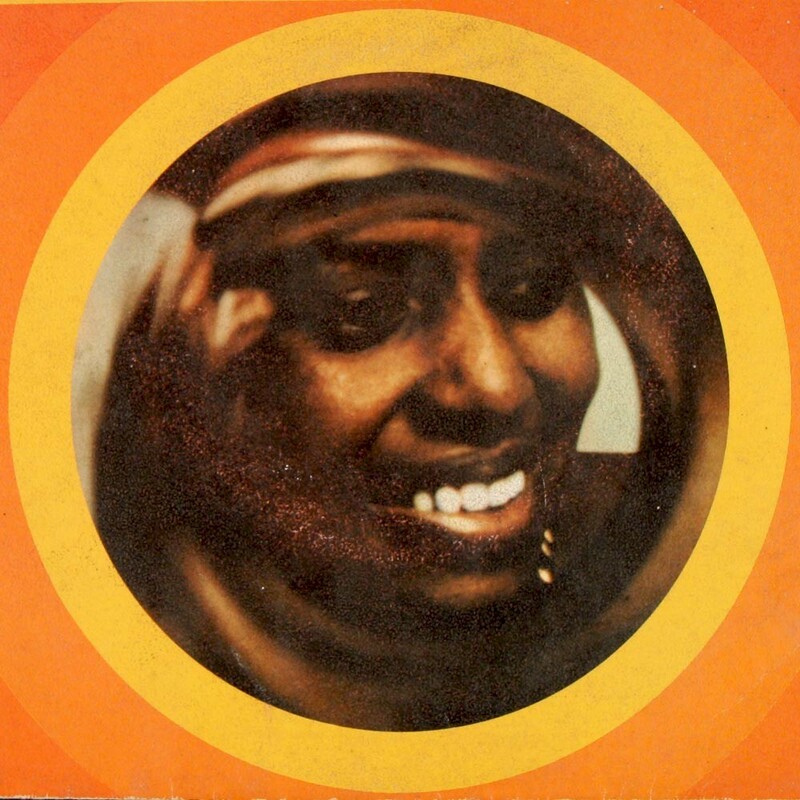 Kudos to Siemon Allen at the always-worthwhile Electric Jive blog for Miriam Makeba - Tracks Less Travelled (1958-98), a fascinating overview of the work of the great South African diva. There are plenty of audio rarities here and lots of little-known facts. Altogether a must-read and must-listen, and highly recommended! I've got a couple of posts in the hopper that will be ready to go in a day or two, but I wanted to bring to your attention a couple of worthy submissions over at other blogs. At Matsuli Music Jonathan Ward of Excavated Shellac, inveterate collector of all things 78 RPM, gives us a wonderful collection of classic music from South Africa, Phata Phata: 78 rpm Records from the Birth of Mbaqanga. Amazingly, these recordings are all from the 1960s, long after 78s were phased out in most parts of the world. Well worth downloading! I'm continually astonished at the stuff Matthew Lavoie over at African Music Treasures digs out of the Voice of America vaults. 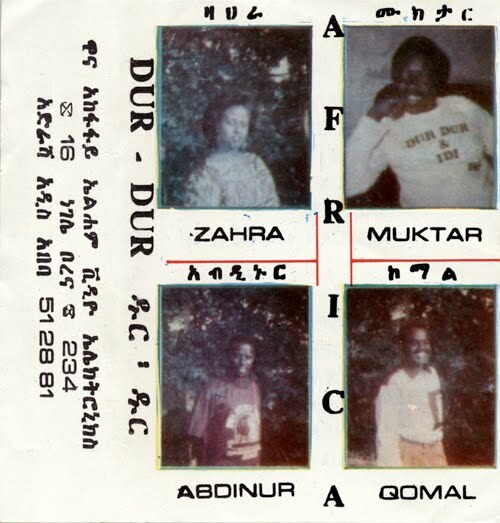 This time he's come up with some amazing 45s from early-'70s Somalia. Who would have thought such a thing existed? If you enjoyed the recordings by Iftin I put up here some time ago, hie thee over and check them out. Please join me in welcoming to the Blogosphere our good friend Fabian Altahona Romero of Barranquilla, Colombia. His new Africolombia blog promises plenty of wall-scorchers, not only from Colombia but from Nigeria, Congo and points farther afield. Since starting the blog on January 2o, Fabian has posted: Ernesto Djedje, a cumbia remake of Fela's "Shakara" by Colombia's Pedro Beltran, a number of other killer Colombian 45s (I haven't had time to download them all yet), Nigeria's Imo Brothers, Bopol Mansiamina, and much, much more! I check the Google Analytics statistics for Likembe every morning, and I'm amazed at the number of hits that come from Colombia, most from the Cartagena-Barranquilla area. There are some serious African music fans around those parts! 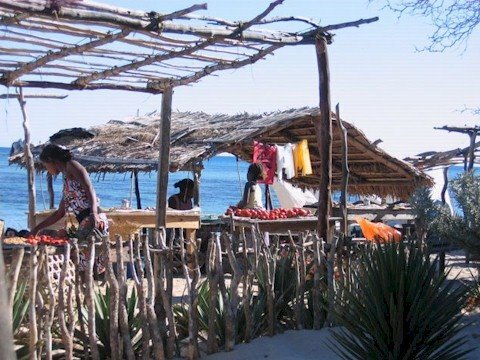 If you enjoy Champeta and the other African-inflected sounds of Colombia's Caribbean coast as much as I do, and are interested in further explorations, you could do a lot worse than to check Fabian's blog out. I just had to share this with you as soon as I got it. Matthew's new blog is just incredible. It's great news for African music lovers and I'm proud that I played some small part in bringing it about. Check it out here. Hello, I hope this message finds you in good spirits. My name is Matthew Lavoie. I am a music broadcaster and producer for the Africa service of the Voice of America. We broadcast throughout Africa in English, French, Portuguese, Amharic, Tigrigna, Oromo, Hausa, Swahili, Ndebele, Shona, Kinyarwanda, Kirundi, and Somali. 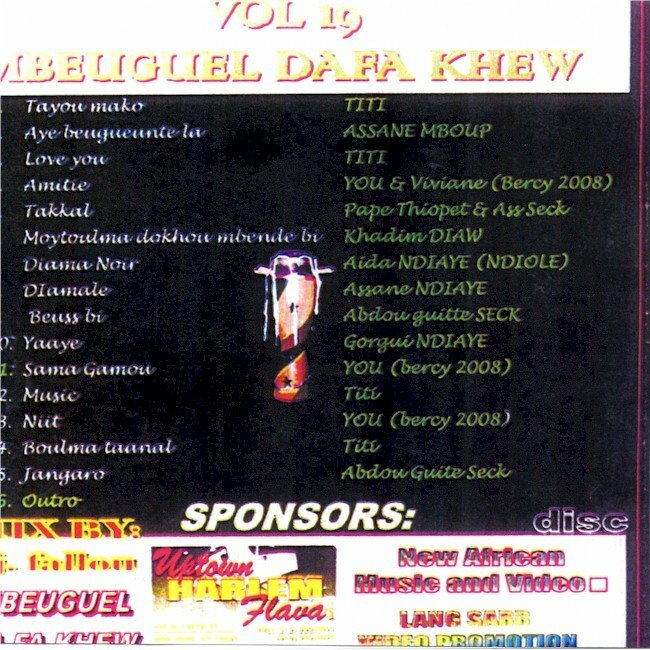 I have consulted the discographies of African music that you helped put together for many years, and for the last three months I have been a regular visitor to your Likembe blog. Likembe is one of the most informative and diverse African music blogs I've read. Thanks for all of your efforts!! I especially enjoyed the Daro Mbaye entry, and your recent postings about Somali funk ... great sound files, great videos, and I appreciate the effort you made to talk in detail about particular songs. I am just getting this thing rolling and will add new entries weekly. I am also hoping that you can help me! The first entry I posted featured the Rwandan musician Bizimungu Dieudonne. I love his music but have not been able to learn much about him. Do you know anything about him? his career? his discography? Thanks again for all of the great music at Likembe!! If you've been around the African music blogosphere for a while you've probably chanced across an incredible site entitled Voodoo Funk. 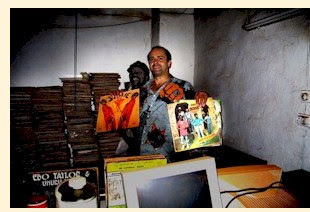 Here an intrepid German named Frank, or "DJ Soulpusher" (right), recounts his adventures digging up old vinyl recordings across West Africa, with a special emphasis on Benin, which, for a small country, has produced an inordinate amount of wild, funky and just plain out there music. The really great thing is, every month or so Frank posts a mix of his latest discoveries. Sure, they're usually scratchy as all get-out, but that only adds to the overall ambiance. Close your eyes and you can imagine yourself sitting in a dusty, stifling record shack in Cotonou, drinking an ice-cold (or not-so-cold) Star or Gulder or whatever they drink in Benin, just rockin' out. 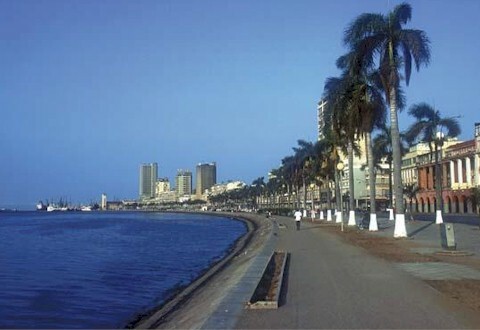 "....One day, I decided to visit Bohicon, a town about 70 miles to the North of Cotonou. My guide Didier and I travelled in a bush taxi and upon arrival chartered two motorcycle taxis with local drivers who said they'd know some places where we would find records. The first spot was at a store that sold cassette tapes, records as well as radios and all other sorts of electronic equipment. The records were in two large wooden boxes that also contained swarms of large cockroaches and silverfish. Most paper sleeves had been eaten away partially by insects. The closer we got to the bottom, the lesser intact the sleeves and the thicker the bug droppings inbetween records. The air was thick with dust and and a dark layer of dirt and bug excrement started to cake onto my hands and lower arms. When I was finally through with everything, we jumped on our bikes and zoomed across a labyrinth network of dirt roads finally reaching a big one story building with clay walls. "The owner of the records store who had accompanied us on a third bike introduced us to a very old man who had some white medicine smeared all over his body and was only covered around the waist with a piece of cloth. The record store owner went into the next room and returned, one after the other, with three very large wicker baskets that were stuffed with stacks of LPs and 45s. At one point, thankfully long before our visit, the baskets had also given a home to some sort of hornet who had chewed away almost all cover sleeves right up to the records, leaving round layer cakes of vinyl, paper and cardboard. I found a few records where even small amounts of vinyl had been gnawed off by those eager little critters. Things got really rough when I hit the bottom of the last basket that contained mostly 45s: The hornets had built chambers and tunnels inbetween the records, using a red, claylike substance that I guessed consisted of chewed up record sleeves, earth and hornet spittle. To make things even more bizarre, large pieces of insect shells were baked into the thick, red crust. Otherwise, the records that I could see the surface of seemed unplayed and the fact that most of them were present in multiple copies supported the idea that this was dead stock. I decided to also buy the claycaked ones, including the embedded insect parts. . ."
Frank indicates, by the way, that two record companies have expressed an interest in producing compilations of this music. Serious reissues of vintage Beninois Afro-funk, remastered from the original recordings. . . it's a dream come true! 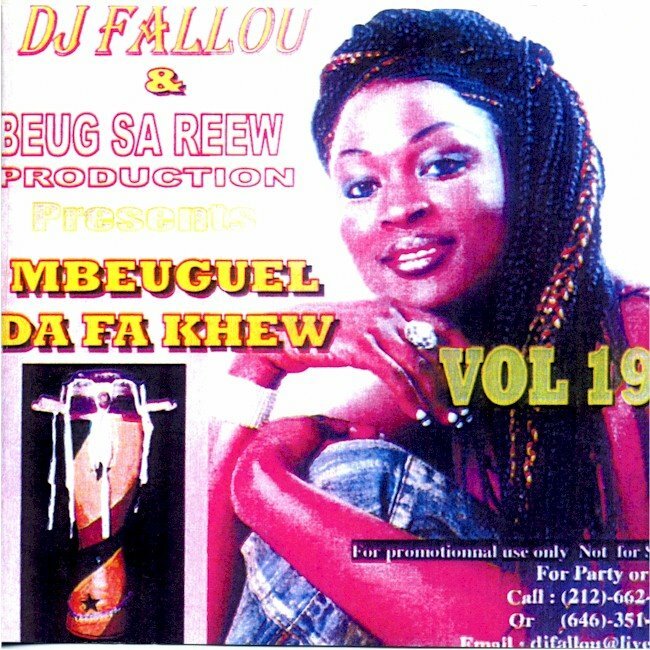 Update: There is another very interesting anecdote about Benin, and some ultra-rare, unreleased tracks by Poly-Rythmo de Cotouou here. Update 2: Those three new mixes are online here.